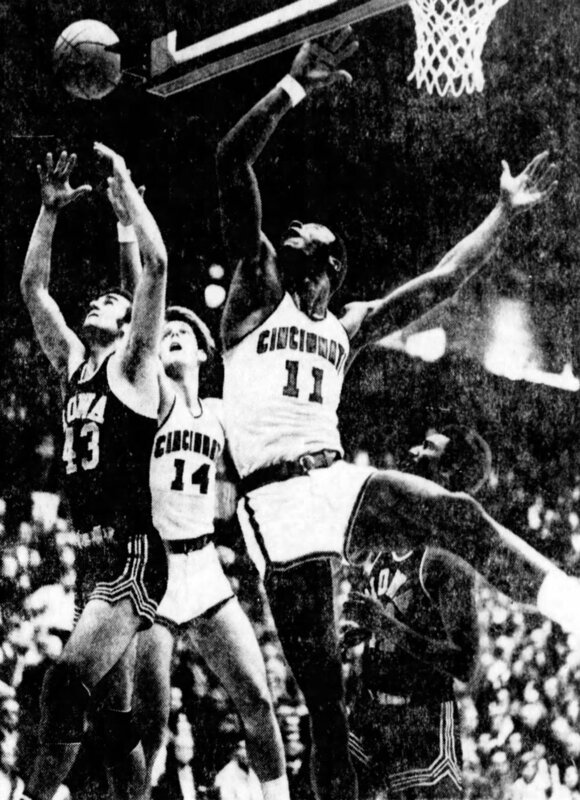 Cincinnati vs Iowa: A Basketball History — OhVarsity! The Bearcats and Hawkeyes are set to tip in Columbus this Friday in the first round of the 2019 NCAA Tournament. I wrote about what KenPom sees as battles to watch between this year’s version of these teams, but it should come as no surprise that programs with a combined 235 years of basketball history have played each other before this week. The first meeting between the programs came in the championship game of the 1959 Holiday Festival Tournament, held at Madison Square Garden. If you know anything about the 1959-60 Bearcats, you know they boasted Oscar Roberston at forward. If you know anything about Oscar Robertson, you know he scored points. Predictably, the senior torched the Hawkeyes for 50, erasing an early 11-point deficit to claim the tournament’s title. The performance still stands as the program’s fourth-best scoring outing ever. He shot 18-for-33 from the floor, 14-for-19 at the line, adding 13 rebounds and four assists. He found himself embroiled in foul trouble midway through the game’s second half, and time spent on the bench is probably the only thing that kept him from exceeding his 56-point performance a year prior—a record which still stands as the most scored by a college player in the history of the arena. Fresh off a home victory over third-ranked Bradley four days earlier, the Bearcats hit Chicago Stadium unbeaten since Christmas. They were on fire, barreling towards their first of two consecutive national championships. Sixth-ranked Iowa presented a challenge, but nobody was beating those Bearcats. The Hawkeyes kept it close early, trailing Cincinnati by just a point midway through the first period. The ‘Cats were relentless, however, and made an 18-6 run into the half. At the break, they were shooting 60% from the field with a 21-7 rebound margin. Within the first five minutes of the second half, the Bearcats had torched their way to a 57-36 lead, and it was all but over. It was Cincinnati’s 11th win in a row. They’d push their streak to 22 games, culminating in an overtime victory over first-ranked Ohio State in the national championship. The programs returned to Chicago Stadium in 1966, and the Hawkeyes secured their first win in the series. The Bearcats had opened the season 8-0 before the collapse, and Iowa’s victory marked the first over Cincinnati for a Big Ten team since 1955—ending an 11-0 Bearcat streak against the conference. Twenty-two points and 16 rebounds from sophomore center Rick Roberson paced the Bearcats, but UC could never get over the hump against an Iowa team that matched Cincinnati's scoring in the second half, preventing a comeback. Iowa’s lone trip to Clifton came in 1969. Tay Baker’s Bearcats lit them up for 114 points on 41 field goals and 32 points at the free-throw line. Fans at the Armory Fieldhouse got a show as UC’s Jim Ard led the way with 41 points and 18 rebounds. Dan Ogletree added 21 points, ten boards, and nine assists. Cincinnati had a 62-59 edge after a torrid first half. They nearly blew the Hawkeyes off the floor in the second, surging to a commanding 99-78 lead. In an attempt to bury Iowa, the Bearcats almost lost the game. A comeback attempt from the Iowans brought the game within 10 points with two minutes remaining before a Hawkeye flagrant foul halted the momentum and allowed UC to bring home the victory. A year after Iowa’s trip to Clifton, the Bearcats made their first and only trip to Iowa City. Cincinnati trailed by 10 points early, finally pulling even with the Hawkeyes halfway through the second half. The teams battled to a 66-66 tie at the end of regulation. In overtime, it was a Charley Snow baseline jumper with 25 seconds left that gave the Bearcats the lead for good. A second meeting between the teams later in the 1970-71 season yielded a nearly identical score. The game returned to Chicago Stadium. The Bearcats, again, emerged with a victory. The first win came in overtime. This one wasn’t easy either. After building an early 23-19 lead, the Bearcats found themselves down ten after a miserable stretch to open the second half. A methodical comeback knotted the game at 63 before a pair of Dave Johnson free throws in the final five minutes gave Cincy the edge for good. After a ten-year hiatus, the Hawkeyes and Bearcats met again, this time in the 1980 Fiesta Classic. Iowa was good. They were fresh off a Final Four trip earlier in the year and ranked 12th in the country. The Bearcats were not good, coming off back-to-back losing seasons. Cincinnati hung tough. The led for much of the first half and went into halftime tied. In the end, 19 points from Bobby Austin weren’t enough, and a 12-for-20 mark at the line and a 47-35 rebound margin doomed UC. Nearly 25 years after that game in Arizona, the NCAA Tournament brought the two programs back together. Coming off an embarrassing loss to South Florida in the Conference USA Tournament, Bob Huggins gave his team a few days off before challenging them in practice leading up to a Thursday game in Indianapolis. Jason Maxiell paved the way with 22 points and nine rebounds. James White added 15 and six. Four Bearcats scored in double figures as UC eased its way to a 12-point win to set up a second-round showdown with Kentucky. The 27,284 fans were the fourth-most to watch a Cincinnati game in program history, and the most to witness a Bearcat win. The ‘Cats lost to the Wildcats that weekend, and the rest is history. The Iowa game would prove to be Huggins’ last victory at the helm of the Bearcats. Cincinnati hasn’t faced the Hawkeyes since.